Is It Better To Buy Or Rent A Property To Stay In? Rent or buy? The overwhelming answer in Singapore is “buy.” Homeownership rates in the country are among the highest in the world. Over 90% of Singapore’s population lives in their own homes. Most Singaporeans think that a high homeownership rate indicates rising prosperity. To a certain extent, this is correct. Back in 1950, most of the country’s population lived in slum-like conditions. In 1960, the Housing Development Board was established. At that time, Singapore’s per capita GDP stood at US$427. Today, the figure is close to US$58,000. The steep rise in income was accompanied by steadily increasing homeownership rates. The data reproduced above reveals some startling facts. 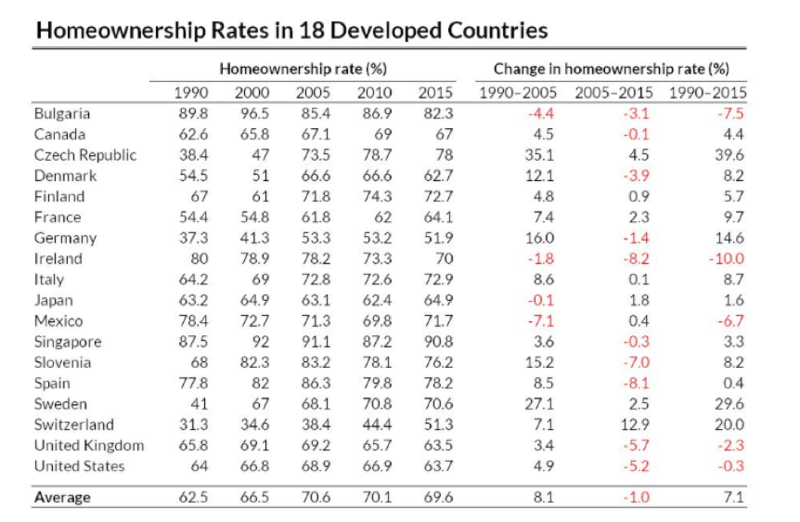 Countries like the United Kingdom and the United States have homeownership rates that are a little above 60%. Prosperous nations like Germany and Switzerland have even lower rates. Only about half of the residents in these countries own their homes. ⇨ The government encourages homeownership – you can use your CPF savings to buy housing. You can even use these savings to make mortgage payments. ⇨ There are tax deductions available for mortgage payments – the interest payment on your mortgage is tax deductible. ⇨ There’s property tax relief as well – if you live in a property that you own, you pay owner-occupier tax rates. These are lower than the regular rate. But there’s another reason for residential property attracting so many buyers. Singaporeans expect to make money on their investment. There is an impression that residential real estate prices will always continue to move upwards. In April 2017, an American investment bank and financial services company published a report that predicts that Singapore’s residential property prices will double by 2030. That’s an annual increase of 5-6% per year. So, what does this mean for ordinary Singaporeans? If you don’t own your own home, should you rent or buy? Let’s analyse the merits of each option. Buying a home in Singapore is expensive. Of course, prices vary based on the location and the size of the property. But remember that you will probably have to raise a large loan as well as arrange funds for the down payment. According to the existing rules, a minimum down payment of 25% of the value of the property is required. This could be higher if the tenure of the loan exceeds 30 years or the loan extends past your 65th birthday. In addition to the down payment, you have to pay buyer’s stamp duty and, possibly, additional buyer’s stamp duty, as well. After you make the purchase, you will have to contend with maintenance costs, insurance, and property taxes. It is likely that you will spend a substantial amount on renovating your flat as well. If you can’t afford all this, you will have to opt for renting a place to stay. Do you plan to move soon? If you can afford to buy a home, is it always a good decision to go ahead and make the purchase? One factor that you must take into account is the length of time that you plan to stay in the property that you buy. If you are reasonably sure that you will remain in the same house for the next ten or 15 years, or even more, then it may be advisable to opt for a purchase. However, if you think that there may be a reason to move out in the near future, then your decision to buy may not be such a good idea. There could be many reasons to want to move to a new residence. The size of your family may increase, you may want to move to a location that is closer to your parents, or you may be able to afford a home that is near your place of work. Keep this point in mind when you are taking your rent versus buy decision. You don’t want to have to sell soon after you make your real estate purchase. The process is time-consuming and expensive, and you could be forced to dispose of your property when real estate prices are low. How highly do you value the convenience of staying in the same location? One of the most significant disadvantages of staying in a rented home is that you would have to renegotiate your lease periodically. Your landlord could insist on a substantial increase. This could mean looking for a new place to stay. The other option would be to pay up and bear the extra expense. But you wouldn’t face this problem if you bought your own home. There would be no need to pay a higher rent every year. Neither would you have to go to the trouble and expense of packing all your belongings and shifting to a new place. There is no one-size-fits-all response to the rent versus buy question. Your decision would depend upon the amount of money that you have at your disposal, your personal preferences, and the likelihood of having to move in the near future. However, for most Singaporeans, the decision is relatively straightforward. Practically every individual who lives in the country would like to own his or her own home. It provides a sense of security and permanence that is hard to achieve with a rented flat. It is also quite probable that your purchase will appreciate in value over time. This is usually a notional capital gain because you will continue to live in the property that you have bought. But you always have the option of downsizing and using the surplus money for some other purpose.